Orange Labs, Issy Les Moulineaux, Paris. 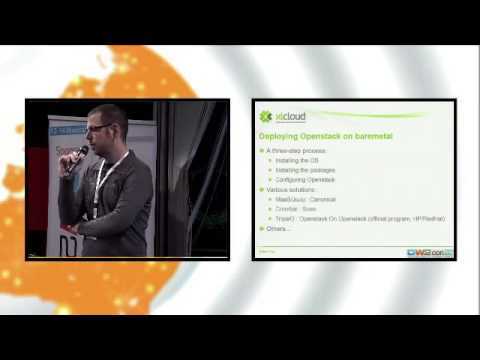 XLcloud is presented at the OW2con'13 conference, in the "Open Cloud" conference track. Provisioning the Cloud within XLCloud, Sylvain Bauza, Bull. XLcloud is a three-year long collaborative project funded by the French FSN (Fonds national pour la Société Numérique) programme, call Cloud n° 1, that was initially submitted under the name ''Magellan''. XLcloud strives to establish the demonstration of a High Performance Cloud Computing (HPCC) platform based on OpenStack that is designed to run a representative set of compute intensive workloads including more specifically interactive games, interactive simulations and 3D graphic applications. In this context, provisioning a full stack from baremetal nodes to running PaaS (Platform-as-a-Service) implies many challenges that XLCloud team has to deal with day-to-day. The goal of this talk is to discuss about the current state-of-art on how to deploy and configure Openstack, how these tools can help XLCloud to match its needs and the current status of the project by itself.